Happy New Year everyone! We are already in the last week of January and boy did it go fast! I know I have been M.I.A for the past couple of months but I had felt stuck within myself. I wasn’t feeling very inspired and so I had to just take a break from the blogging. 2018 wasn’t my best year so now it’s time to pull out of this slump I was in and make 2019 my year. Anyways enough about me, let’s get on with the fashion trends of 2019! Not like it’s anything new, but these shoulders are taking on a rounder shape. Puffy shoulders look best with square and v-necklines. A trend I look forward to trying one day. Bright, sparkly and dazzling. Sequins never really go out of style. They’re in the spotlight one day and take a break the next day. Then back up again. They are just always…there. So it’s pretty hard to ignore. Thank goodness, biker shorts are gone. Can we please bring in a more sensible set of shorts? Let’s give this tailored, knee-length masculine alternative over to the spotlight. Earth tones are back and they aren’t going anywhere, any time soon. Starting with an array of shades, creams, tans, and khaki. Just remember to stay neutral minded when wearing these tones. The utilitarian look isn’t so traditional anymore. If you weren’t a fan of this trend, you may want to give it a try now. Its safari chic meets modern military. Stare at your shades of khaki because utilitarian never looked this good. 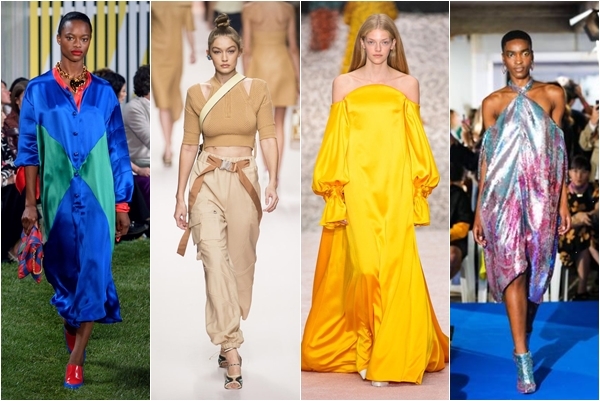 Colors of lemons, marigolds, and butter were vibrantly lighting up the runways. It’s the choice of color this coming Spring and I think the Sun will feel very proud. So I heard, color will be all over the place this coming Spring, so you don’t have an excuse to not color-block. And if you do, shame on you. It’s time to bring some mingling colors into your life. California’s craftwork pretty much speaks for its self, doesn’t it? Easy, breezy and a bit see-through. Crochet was spotted on the runway at Oscar de la Renta and Victoria Beckham. What is your favorite upcoming trend so far?